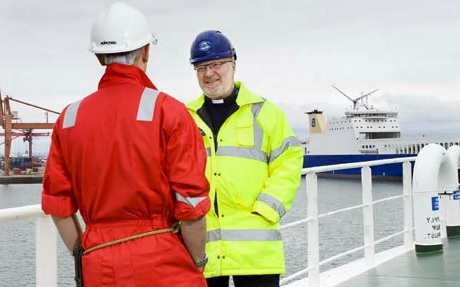 Anglican agency Mission to Seafarers (MtS) has welcomed a new convention that, when it comes into force next week, will mean significantly better working conditions for millions of seafarers worldwide. The International Labour Organisation's Maritime Labour Convention (MLC) marks a new era for the 1.3 million seafarers whose ships carry 90 per cent of the world's trade. The Convention has been ratified by some 60 countries and comes into force on 20 August. It will update more than 60 maritime labour standards to create a comprehensive system of care covering such issues as welfare, employment conditions, training and medical care. This is important because far too many seafarers - particularly those from developing world nations where other jobs are scare - are vulnerable to unscrupulous ship owners and employment agencies who exploit them. "The MLC's entry into force means that an equal system of justice for everyone - from the first-time seafarer to the experienced shipowner - is in place for the first time," said MtS Worldwide's Justice and Welfare Officer the Revd Canon Ken Peters. "The international community now has a suite of conventions that together provide for training and education, safety of life at sea, environmental issues and now welfare and working conditions, thanks to the MLC." The encouragement of Port Welfare Committees to oversee the conditions of the Convention. The Convention will sit alongside the International Convention on Standards of Training, Certification and Watchkeeping for Seafarers (STCW); International Convention for the Safety of Life at Sea (SOLAS) and International Convention for the Prevention of Pollution from Ships (MARPOL) and is referred to by many as the "fourth pillar" of seafarers' rights. The Mission to Seafarers is an Anglican agency that works in over 260 ports caring for seafarers of all ranks, nationalities and beliefs. Through its global network of chaplains, staff and volunteers it offers practical, emotional and spiritual support to seafarers through ship visits, drop-in centres and a range of welfare and emergency support services.